Louis Barnett is a young entrepreneur, chocolatier and conservationist with a passion for producing chocolate products of the highest quality. Louis left school at the age of 11 after being diagnosed with Dyslexia, Dyspraxia, Dyscalculia and other learning difficulties to be home tutored and began his journey into chocolate at the age of 12 by making a chocolate cake for a relative’s birthday. 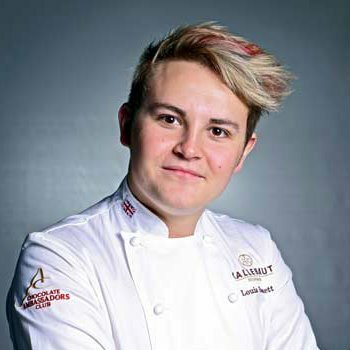 At just 21, Louis was invited by Callebaut to join the prestigious team of World Chocolate Ambassadors. Louis is an international chocolate Ambassador and is the youngest ever to have been invited in their 100 year history. After that first cake at age 12, word spread and orders began to come in. Louis was supplying local restaurants and pubs with his delicious cakes and soon was supplying many delicatessens. Louis found his passion for chocolate could be turned into a business, and the more he learned the more he wanted to develop his skills. Louis wanted to learn as much as he could about the world and business of chocolate and set about researching. He came across Callebaut, the world’s largest manufacturer, and found they had an Academy in Banbury Oxford. In April 2007 Louis attended a 3 day professional course at age 15 and came to the attention of Callebaut’s UK manager and they offered to sponsor all his training for life. This was something that Callebaut had not done before and Louis then began running through the whole curriculum of courses offered by Callebaut. Louis was trained by the best of the best within the chocolate industry. Louis launched ‘Chokolit’ in 2006 and attended a local food group, Heart of England Fine Foods, as the platform to launch his unique product. This was picked up by a journalist from ‘The Grocer’ magazine. At aged 14 Louis contacted the buyer at Waitrose/John Lewis and after a successful meeting had his first order confirmed. Then, in 2007, Louis showcased at the IFE (International Food Exhibition) and secured a contract with Sainsbury’s. Louis opened his first chocolate factory in August 2007 at the tender age of 15 and then supplied Selfridges at sweet 16. Louis studied chocolate at a molecular level so truly understands what flavour combinations work and how he can show the world what is possible when you tear up the rule book. He believes in pushing the boundaries of his creativity. Louis believes the more you understand your ingredients the more you can innovate. Louis is so passionate about his products he only allows the highest quality ingredients to be blended in to his creations. He sources his cacao beans from all around the world with the help of world leading suppliers who are at the forefront of technology in the chocolate industry.